As the cost of attending state flagship universities passes $30,000, many families are considering the financial benefits of starting at a community college and then transfer to a 4-year university. 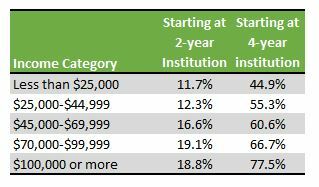 Combining living at home with paying only a third to half of the tuition of a 4 year public institution represents significant savings. However, those savings will exist only if students actual path in real life follows the plan–and that is far from being certain. The biggest problem in starting at a community college is that most students fail to transfer to a four-year college to complete their degree. The following data from the National Center for Education Statistics shows the percentage of students who complete a bachelor’s degree in six years according to family income and the starting institution. Once students arrive on a four-year campus, there is increasing evidence that they are just as likely to graduate. This one of the reasons why more colleges, including private institutions are recruiting community college transfer students. As colleges faces a smaller pool of high school graduates, community college students are an attractive way to fill seats. After all, they’ve already proved they can do college level work. Recruiting college transfer students is becoming a financial necessity for an increasing number of colleges, especially in the midwest. You can see it the growing amount of financial aid, both merit and need-based, colleges are offering transfer students. Previously, transfer students were more likely to be only offered loans. However, as the competition increases, transfer students are starting to see merit awards offered an incentives for attendance. There have an increasing number of announcements of community college transfer agreements between four-year institutions and community colleges. Drexel University and the Community College of Philadelphia announced a transfer program that includes specific scholarship amounts depending on the student’s GPA. California Lutheran University and Baylor University have also initiated or expanded existing transfer agreements. Despite the growth of these transfer agreements, they are not always easy to find. CollegeTransfer.Net lets users search for transfer agreements by college but its database is incomplete. For example, it doesn’t list the pre-admission partnerships between Austin College, a private liberal arts college and four Texas community colleges. Some states have established statewide articulation agreements between community colleges, public universities, and some private institutions. North Carolina has a comprehensive Transfer Course List. Virginia has guarantee college transfer agreements between their community colleges and state universities. However, students in other states, such as California, still face significant obstacles in transferring from community colleges. Of course, a college doesn’t have to have a formal articulation agreement to apply as a transfer student. The University of Southern California accepts a large number of transfer students, especially for a highly competitive institution, and it doesn’t have any formal transfer agreements. Ultimately, any student interested in starting at a community college must should check with their eventual destination college for all available agreements. Out of over 1,500 colleges that have 500 or more full-time undergraduates, 672 has the same percentage of transfer students as USC, 8%, or higher. The institutions are pretty evenly split between public and private schools. However, only 126 have graduation rates of 49% or better. Of those, 98 accept at least 50% of applicants through freshman admissions. The following table shows the 50-50 colleges for college transfer students based on the highest percentage of transfer-in students. New York has the most colleges with 13, followed by California with 11, and Pennsylvania with 9. The four-year graduation rate is used for private colleges and the five-year rate is used for public institutions.